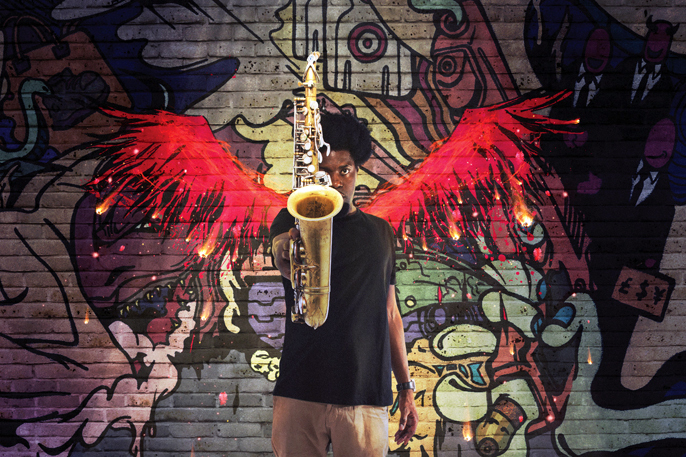 Award-winning jazz and hip hop artist Soweto Kinch returns to the Albany this October with a dynamic fully staged performance of his critically acclaimed album, The Legend of Mike Smith. The show follows an auspicious launch at Birmingham Repertory Theatre’s newest auditorium, The STUDIO. As an Albany Associate Artist, South East London’s favourite theatre is only too happy to welcome Soweto back once again. Smith is portrayed by a double narrator (a device, coincidently, also used in Kurt Weill’s Seven Deadly Sins). Smith’s inner thoughts are narrated by Soweto with the protagonist and other characters played by dancers and actors, Tyrone Issac Stuart and Ricardo Da Silva. The end result is an inventive narrative and absorbing combination of animation, dance and music that melds wide-ranging influences from jazz and Bach chorales to hip hop and freestyling. An alto-saxophonist and MC, Soweto Kinch is one of the most exciting and versatile young musicians in both the British jazz and hip hop scenes. He has amassed an impressive list of accolades and awards on both sides of the Atlantic including a Mercury Music Prize nomination, two UMA Awards and a MOBO for Best Jazz Act in 2003 and 2007.